Holy CRAP! Where to start? 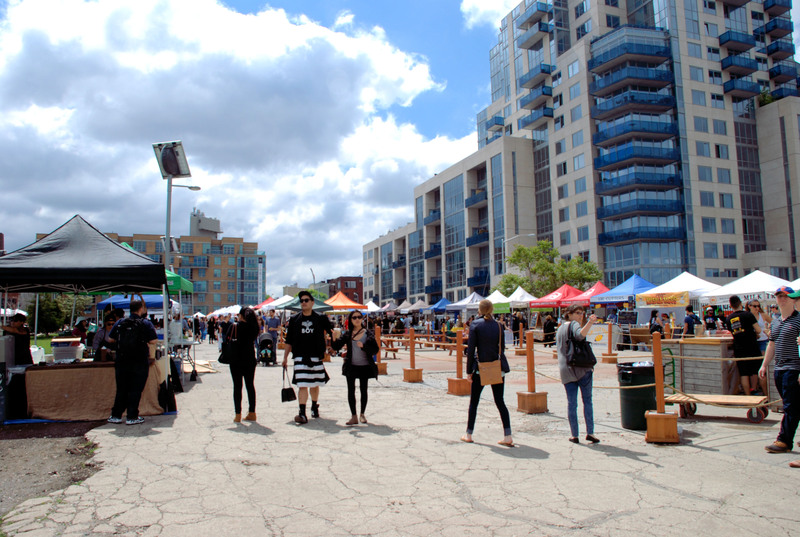 I’m the girl who has dreams about food so when I heard about Smorgasburg in Brooklyn, it easily became my main focus for our trip. 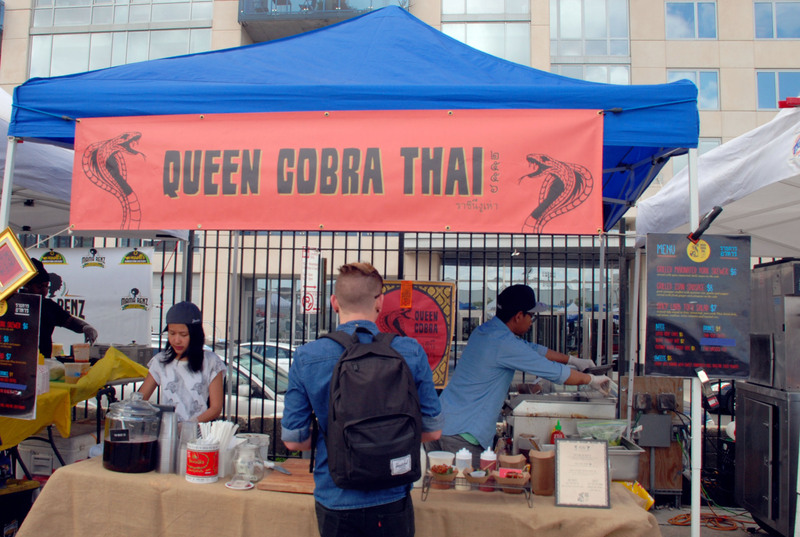 Smorgasburg is a food flea market that takes place on the Williamsburg waterfront on Saturdays and on the Brooklyn Bridge Park’s Pier 5 on Sundays. I even booked an AirBnB in Williamsburg on Friday night just so I could be within walking distance of it on Saturday morning because unfortunately, Saturday was the end of the New York trip and we had to be in Chinatown by 2 p.m. to catch a bus to visit my friends in Maryland. With that being said, Smorgasburg opens at 11 a.m. so my boyfriend and I had about an hour and a half to devour anything and everything we could possibly get our hands on. I started off with the Lumpia Shack. Lumpia=filipino eggrolls. It’s not everyday you see a food establishment solely dedicated to lumpia or even filipino food in a setting like this; you usually have to make a point to seek them out. I got the sampler which included pork, truffled adobo mushroom, and peking duck. Pork was hands down the winner. Your basic lumpia will typically include pork and classics are often hard to beat. I was very impressed that there was a vegetarian option and a vegetarian option done well! Lumpia is probably the gateway to filipino food. Just about everyone knows what eggrolls are and here they are, just with a different name. I think I like lumpia the best but mainly because there is typically a vinegar, soy sauce and garlic mixture to dip them in. If you’ve never had filipino food and want to take baby steps in trying some, start here! While I went for the lumpia, the boy found himself at Queen Cobra Thai. 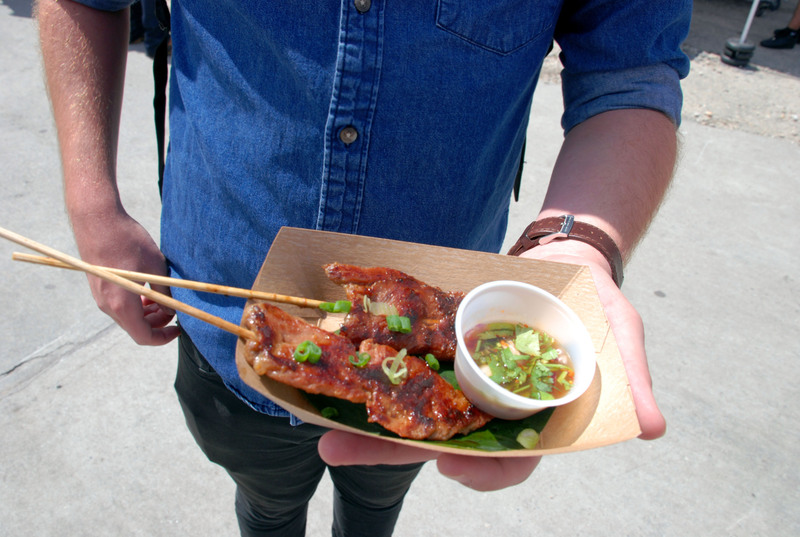 I probably wouldn’t have made my way to this booth on my own, but the grilled pork skewers with Thai spicy Jim-Jaew sauce that he got was something I definitely would’ve missed out on. The pork was tender, easy to pull apart, and perfectly balanced between sweet and salty. It would be the perfect companion to a beer that we unfortunately lacked. I wished I had more of this. 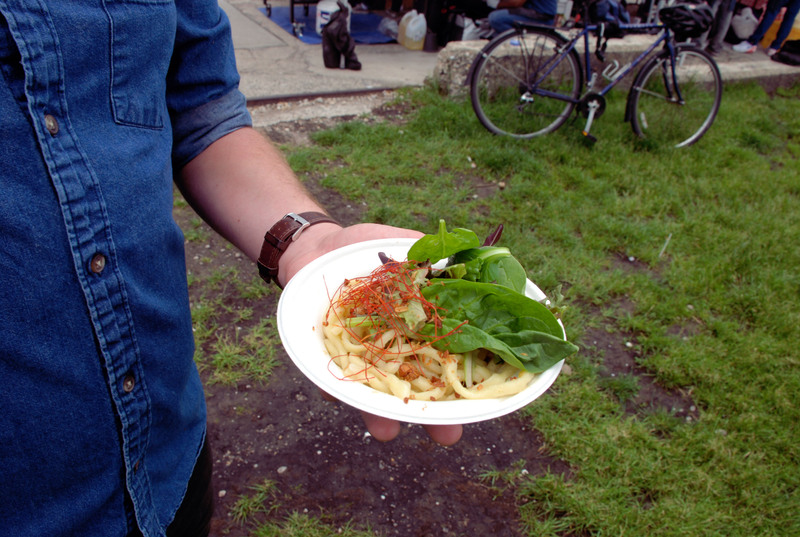 After roaming around the Smorgasburg grounds, I was trying to mentally create a list of food to be devoured. I tried to strategically plan which foods should be consumed in what order for maximum capacity in my belly. As I tried to devise a master food plan, I found my boyfriend at this vendor. 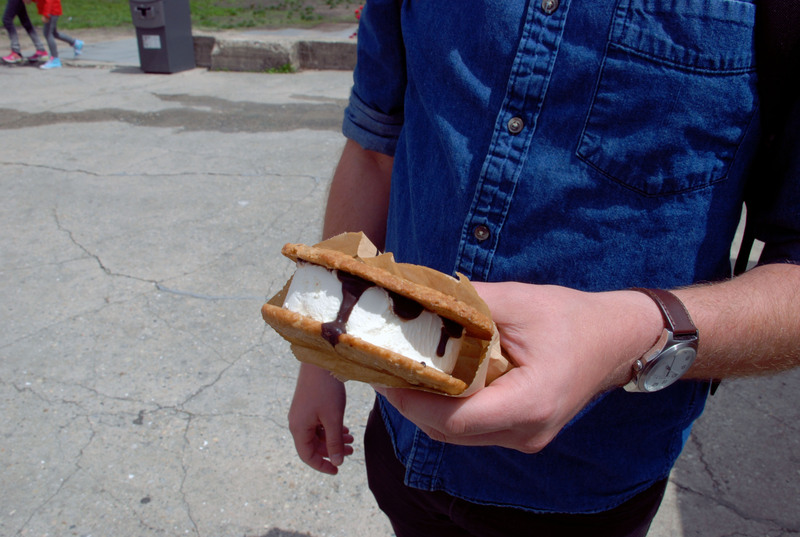 My boyfriend and I are not huge on sweets, but here he was, getting an ice cream sandwich. A very delicious ice cream sandwich I might add. We were still at the beginning of our food ventures and I did not want to be taken out this early in the game. Ice cream would have been the rain of my parade. Dat cookie doe. 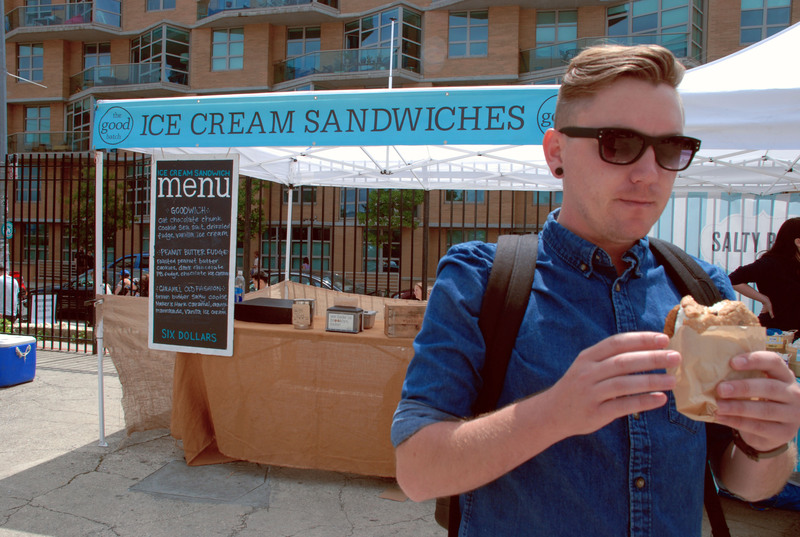 The Goodwich- Oat chocolate chunk cookie, sea salt, drizzled fudge and vanilla ice cream. If I was in the mood for sweets, that would have been everything I could ever want. It’s not too sweet, which is key for me and salt involved is always a good thing. The sweetness was not overbearing and the flavors hit all the right notes. Fries, my heart and soul. When I saw them, I just knew. I also knew that it could potentially weigh me down just as the ice cream would, but my love for fries concurs all. My biggest dilemma, however, was whether I wanted lemon garlic aioli or malt aioli. After consulting with the kind lady at the booth whom also displayed stress for having to decide between the two, she told me that if I like malt vinegar, it has a really strong malt vinegar flavor. I was SOLD! My concern was that the malt aioli would be more of a hint of malt flavors and she eased all my worries away. It was like putting malt vinegar on your fries, with the convenience of a dip, and not having to sacrifice the crispiness of your fries for the malt flavor. The Home Frite’s site states “we make the crispiest fries and amazing dipping sauces” and that they do. Raw fish meets taco? The one booth that made me feel like I was back in California. Here on the West Coast, we see a lot of Asian-Mexican fusions-from Kogi BBQ to Jogasaki Sushi Burrito– that thrive and well, I don’t hate it! 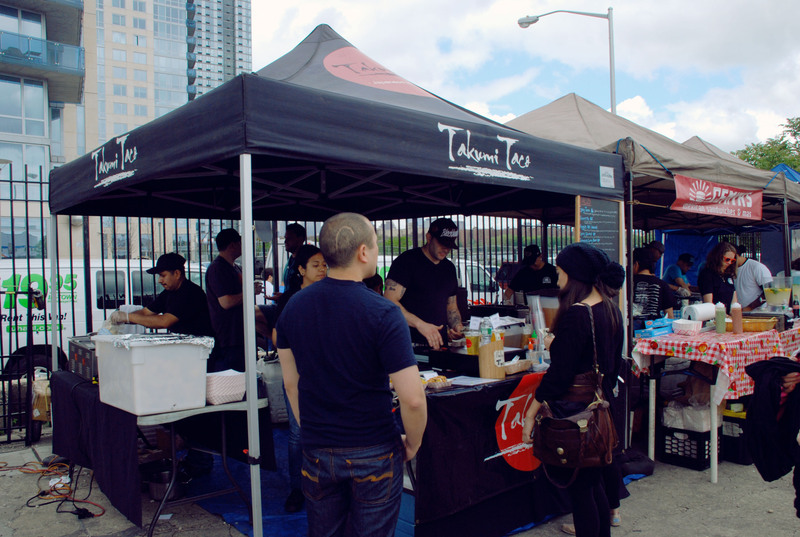 The spicy tuna taco from Takumi Taco taco is another Asian-Mexican fusion I do not hate. The spicy tuna tasted fresh and wasn’t too spicy. I did enjoy that they provide a bed of tortilla chips beneath the taco. In my opinion, it is there to catch any spicy tuna that may fall when you bite into your taco, as things always fall out of your taco when you bite into it. 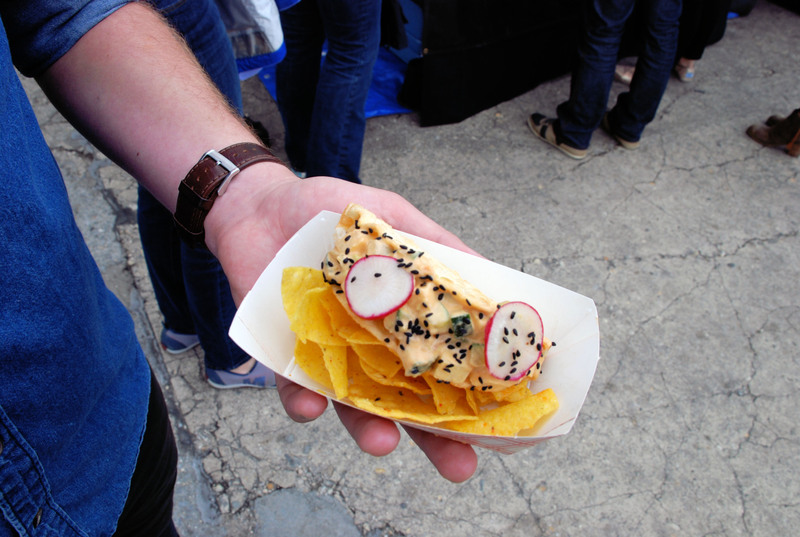 Your spicy tuna will fall to your convenience atop a tortilla chip for your consumption. No tuna shall be wasted! Clever. Watermelon. I did have a delicious calamansi basil tea from Lumpia Shack, but all that food needed more drank. I’m a fan of vinegar. Yes, I enjoy it a lot. 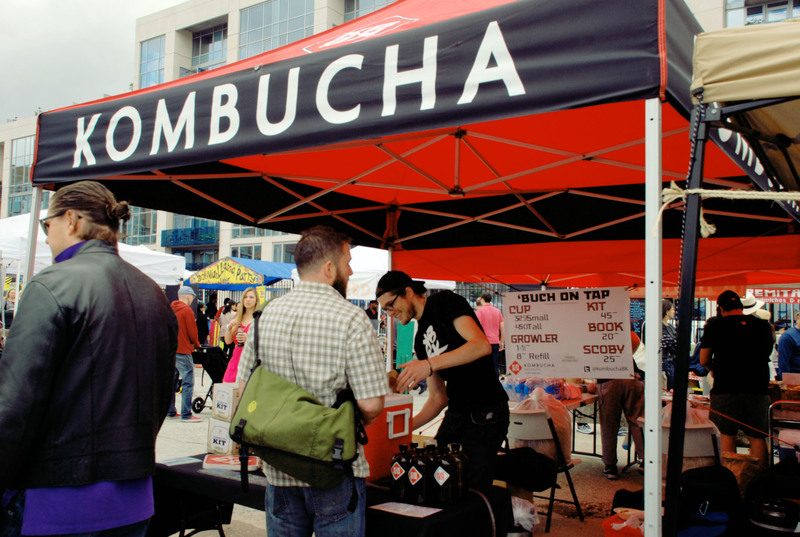 Now a whole booth dedicated to kombucha is the next best thing! I would’ve even gotten a growler if I lived in New York. I just have to say that they had watermelon and since Beyonce been sippin’ watermelon, I just had to do the same. I did see that the other flavor was a sour cherry tart or something? It probably was just as good too! But while I listened to these guys talk, I overheard that everyone loves the watermelon one and have been waiting for it’s return. It’s refreshing for that summer heat, with a little bit of kick from the fermentation of the tea that takes place, while reaping all the health benefits from kombucha! You can read about the health benefits on Kombucha Brooklyn’s benefit’s page. 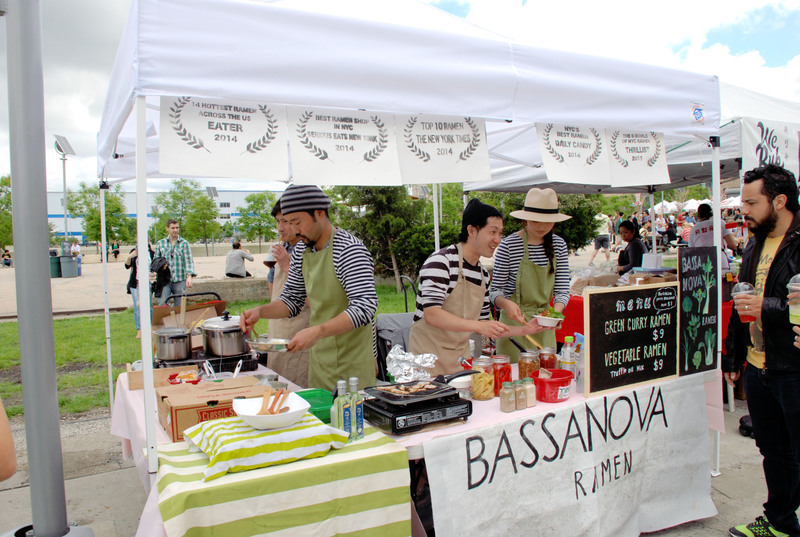 The nontraditional ramen. The Japanese always do a good job at visuals and making things look cute and appealing. They all wore matching striped shirts and seemed very inviting. Their booth boasted a bunch of awards, but we kept walking past them. I think my boyfriend and I put ramen towards the end of our eating journey at Smorgasburg because we didn’t want to be full from all those noodles and broth. Broth? When my boyfriend picked up our ramen, boy was I surprised to not see any broth whatsoever. The whole point of ramen is the broth! I have a love for tsukemen, dipping ramen, but lately I’ve found myself deeply attached to soup. And this ramen didn’t even have anything for me to dip these noodles in too! Now what the hell is this thing? Because it definitely was not ramen. The more I ate, the more I found forgiveness in me for this so-called “ramen” concoction. The noodles were easy to eat, just as if you were lifting them out of a soup, the firmness of the noodles were right, and the flavors were all there without dealing with the mess that can be curry and ramen. This nonconformist dish grew on me and if I could have some right now, I would definitely find my way there. Unfortunately, I am back in California while this ramen is livin’ it up in the Big Apple. To be honest, this was the least memorable dish of all. Not saying it wasn’t good, but I am saying I recall being wrapped up at some other booth while the boy swung by with this little bun. 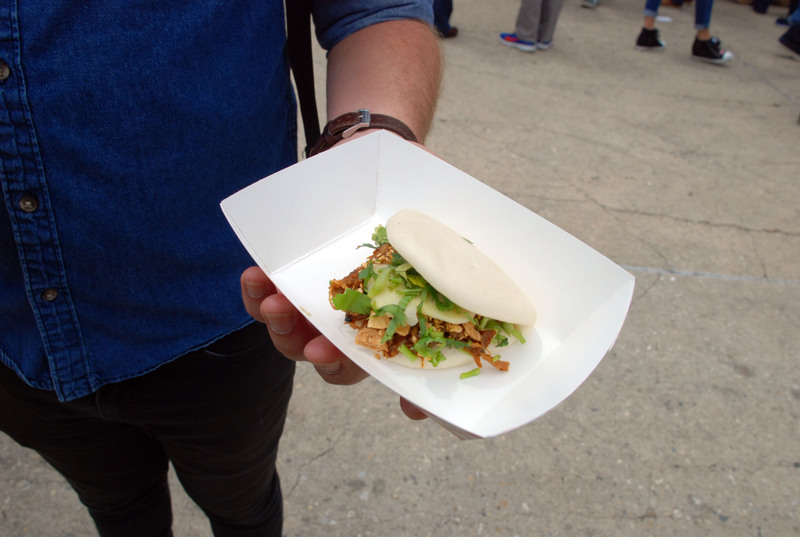 I believe this was a duck bun. That is all I can remember. Maybe I could have loved it; the menu on their website looks good, but I was seriously immersed in something else during this point that I cannot recall the flavors at all. I am also not a fan of duck, so that could also be it. My boyfriend had no complaints. Suddenly, I needed it. I kept going to the booth and would walk away, but when it came close to having to leave, I knew I couldn’t leave without trying this huge thing of the unknown. I was intrigued by it’s size and how they made it. I got the spinach and paneer dosa and it was good! I kind of assumed the spinach and paneer would have been curried; it’s the only way I’ve had it at an Indian place. The spinach and paneer were actually fresh, so it was more of a refreshing rather than heavy dish. After all that other food, I struggled with this one, but it was worth it. 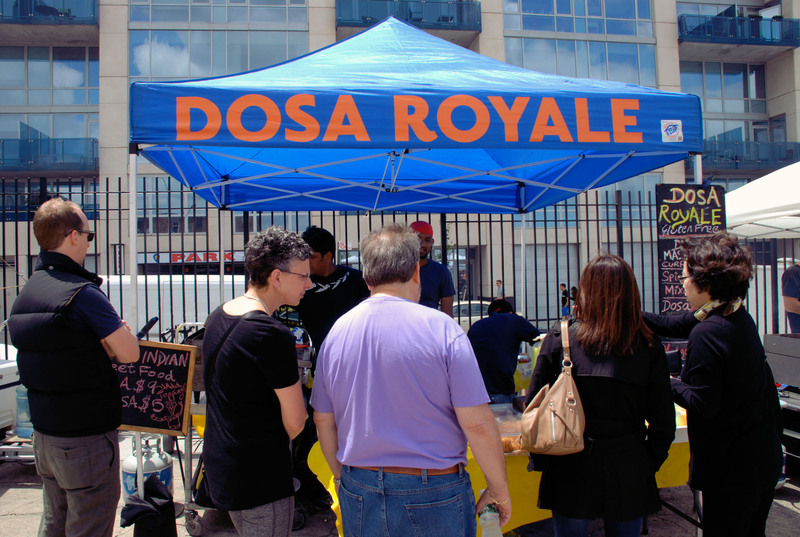 What is a dosa? 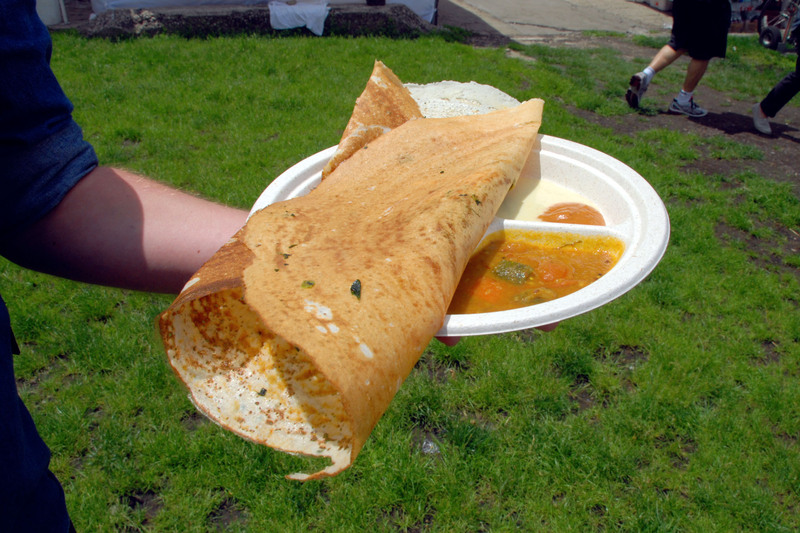 According to their site, a dosa is a savory thin crepe made from a fermented batter of rice and black lentils and is naturally gluten free. 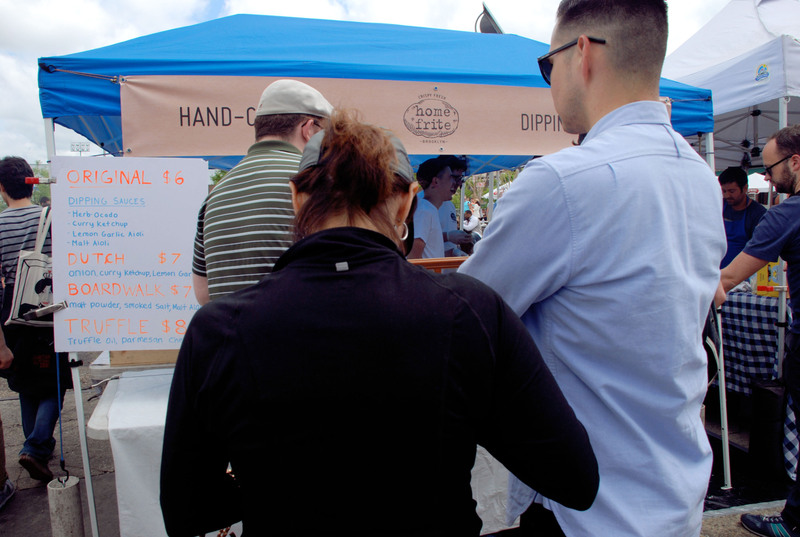 The Ramen Burger line still reigned all the other lines. I was once intrigued by this concoction, but now I choose to not fall into the hype. I’ve heard it’s okay, or maybe I just don’t want to stand in that long of a line, especially with time constraints. I love my ramen and I love my burgers, separate. 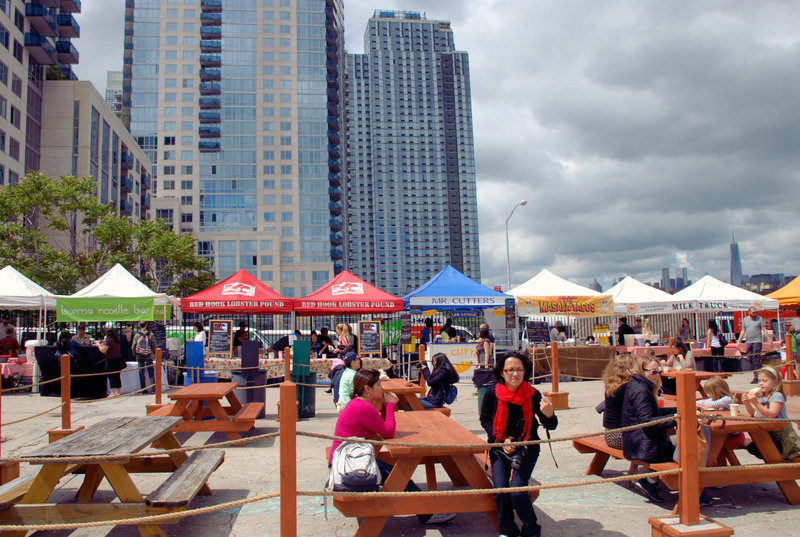 Aside from being a hub for good food, Smorgasburg provides for a lovely view of the Manhattan skyline. 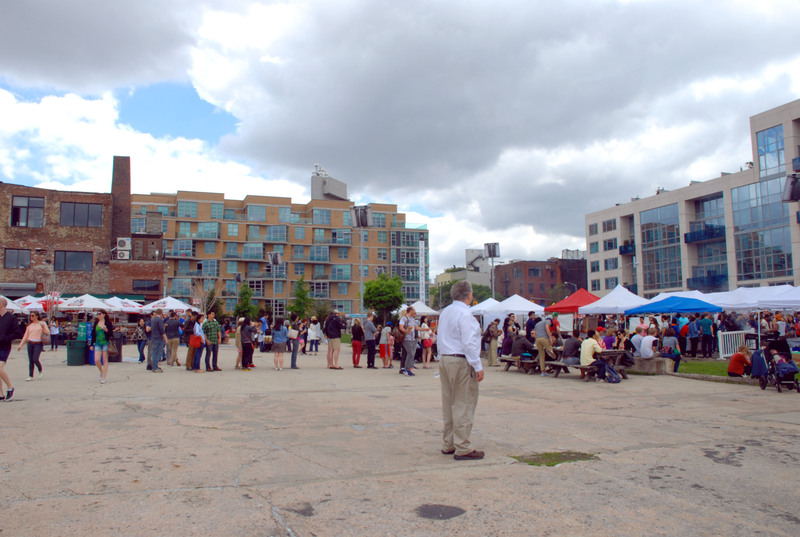 All in all, Smorgasburg was a good note to end our New York trip on. I even purchased some whoopie pies from Batter and Cream to give to my friends, which they enjoyed, and some chimichurri from Elvio’s. 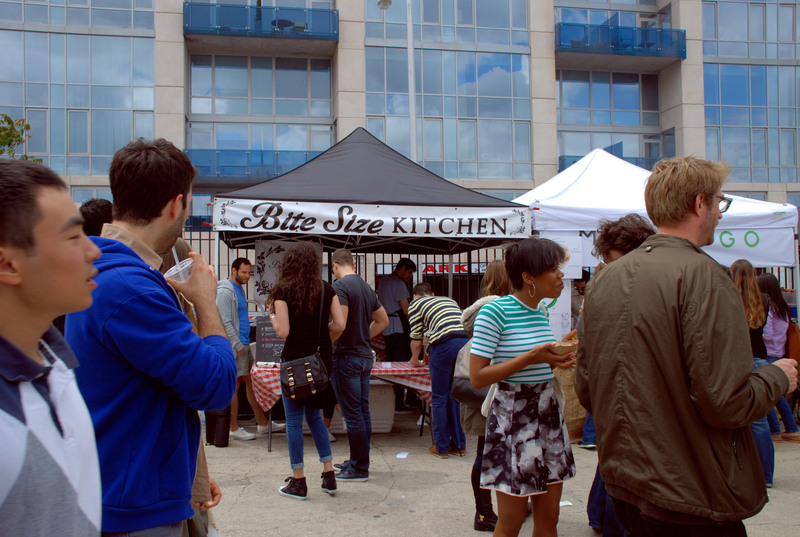 I would love to live in Brooklyn just for the sake of going to Smorgasburg every weekend.